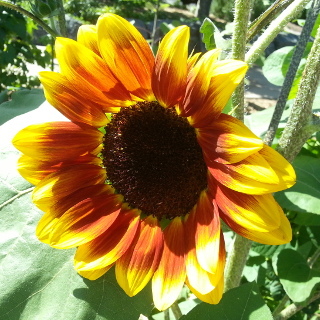 Evening Sun is an ornamental mix of sunflowers in orange, red, bronze, pink and yellow colours with dark centres. Multiple flower heads per plant. The seeds are too small to be eaten but the flowers attract insect pollinators and make an excellent cut flower. 50 seeds per packet. If you would prefer to grow a sunflower that has large, edible seeds we also have the cropping variety Sunflower 'Sunbird' available. An orange-flowered Evening Sun Sunflower, additional forming secondary flower heads are shown in the bottom right of image.